Our Custom Wine Decanters are a perfect addition to your restaurant or bar to aerate your wine. For a lasting effect, custom imprint these Wine Decanters with any design or message you choose. 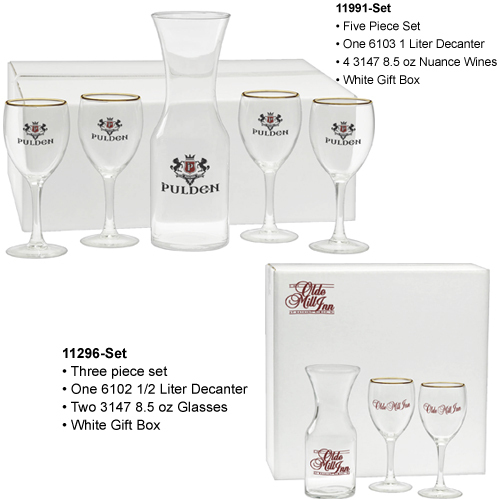 Choose from our single 1/2 liter decanters or our 3-piece Decanter Gift Set which includes a 1/2 liter decanter, two 8.5 ounce glasses and a stylish gift box. 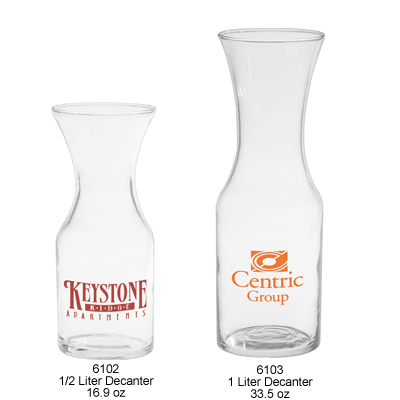 Pricing for Custom Wine Decanters – Call 1-800-233-0828 for more info or to order! 6102 ½ Liter (16.9 oz) Wine Decanter 5.70 5.21 4.99 4.84 4.68 4.37 2-1/2" 2-1/4" 9-3/4"
2-1/2" x 2-1/4" x 9-3/4"
1-1/16" x 2-13/16" x 8-3/4"
It's easy to have your own Wine Decanters and Wine Decanter Sets. Simply call 1-800-233-0828, and submit your camera-ready artwork to graphics@kardwell.com (you may also mail your art). The minimum order is just 72 Decanters. You will receive your Decanters in about 3 to 4 weeks. Rush delivery is available.